It's Saturday morning and time for a new challenge at Allsorts and this week Tracy Mouse is looking for creations which 'Feature a Creature'. Our sponsors are Crafty Ribbons and Deedees Designs. My card uses some of my scenic stamps along with some from Sheena which I just had to have as I knew they would work so well together with the others in my stash. The highland cow........I decided it's a 'she'........ in the foreground was stamped and masked, then the background stamped, clouds added with a mask and background coloured with Pan Pastels. The cow has been coloured with watercolour pencils. Highland cattle are huge by comparison to modern day cattle and it's lovely to see them on a nearby farm who have a couple of dozen of them in a perfect setting with the village Church in the background of the fields where they graze. Morning Peeps, hope all is well in your part of the world. Looks like I'm on a real roll this week, three posts i a week is unheard of recently and it's only Wednesday. I thought I would share some more Tattered Lace work as well as entering two challenges I have been promising to join in for weeks, but time has just got the better of me so time to put that right. 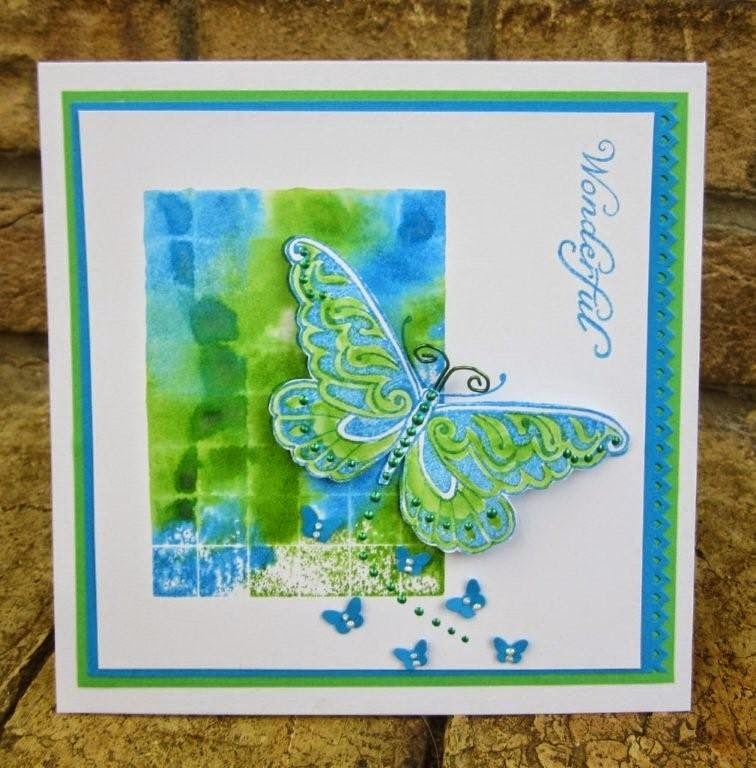 The card at the top is for this months Butterfly Challenge, it's one of a set I made some months back for Stampers Sampler so was not able to post until publication. The gorgeous Butterfly is Penny Black and the background 'stamped' with an acrylic block and distress inks peacock feathers and mowed lawn, I used the same inks for the Butterfly and matted and layered onto coordinating cardstock and a Penny Black sentiment. Next is another Shutter card, I am so loving this clever die and as I have always like cards with a bit of dimension this set really appeals to me. The Tattered Lace blog is still fairly new and we are seeing new followers every day so it's worth signing up as there are often freebies and news as well as new inspiration most days. The card above was inspired by a clear out of my ribbons drawers, truth is I was trying to find space to store new ones so trying to use up the reels with only a yard or two left. And this particular one was a perfect match for a sheet of DP I came across..........that was when I was having another clear out of my DP cabinet. This ones seems to have been in the 'green drawer' forever so I decided to use it up. I made two roses with the ribbon to place at either side of the shutter card and used both sides of the DP as contrast on the panels. The swirly panels have been cut with the TL Tulip flourish die. This is one of my samples for last weekends Four Day Deal on Create and Craft, the DP's are from the new Golden Age CD and the Violin which is so incredibly detailed yet cuts through Centura Pearl like a dream is on a mat embossed with TL Lace Medallion folder. I love the size of the embossing folders, the largest one in the sets is a generous 8"x8".....old fashioned measurements I'm afraid. And at long last I have a card for Mo's Rudolph Challenge, since she took over the reins of this monthly challenge at the beginning of the year I have been promising her I will join in, but shame on me not done so yet. So when I visited her blog early this morning and saw she had just posted the March challenge I had immediate pangs of guilt and set to making a card.......amazing what you can achieve before work if you put your mind to it ! It's a rather quick make, stamping the Hero Arts stamp in black and heat embossing with detail clear powder, some matting and layering and bows down the side. Promise to do better next time Mo. Thanks so much for popping in, hope you all have a good Wednesday. Happy Monday Peeps, I hope your weekend was a good one, the weather was a mixed bunch here in the Fens and a hard frost this morning, but it's led to some nice sunshine. A warm welcome to my new followers and a big thank you for all the lovely comments on my recent posts. Quite a few of those have been my Tattered Lace makes, die crafting is a whole new ball game to me but one I am thoroughly enjoying so it is very encouraging to know that you are liking what I am doing with them. I have not had a lot of time for scenic stamping recently so over the weekend I had a little playand my just for fun session made a lovely change. I used Pan Pastels for the colour on both cards and a mixture of Sutter, Art Impressions and Stampscape stamps. Thanks for taking a peek and hope you all have a good week. It's Saturday morning again which means a new challenge at Allsorts and this week Susan would like to see 'Cupcakes and Cakes', our sponsor is Scrappers Delight. My head went a bit blank on this one I can tell you, not a single stamp in my stash that remotely resembles cakes then I remembered a little bag of Tando chipboard shapes I bought at a show a while back and much to my surprise in it was a cupcake. So I painted it with gesso, then acrylic paints, stamped over the bottom half with a tiny flower stamp to resemble a cupcake case, glittered the top and added some liquid pearls. A Tattered Lace border across the top, some tiny tags which I cut by hand, a bow and button to embellish. 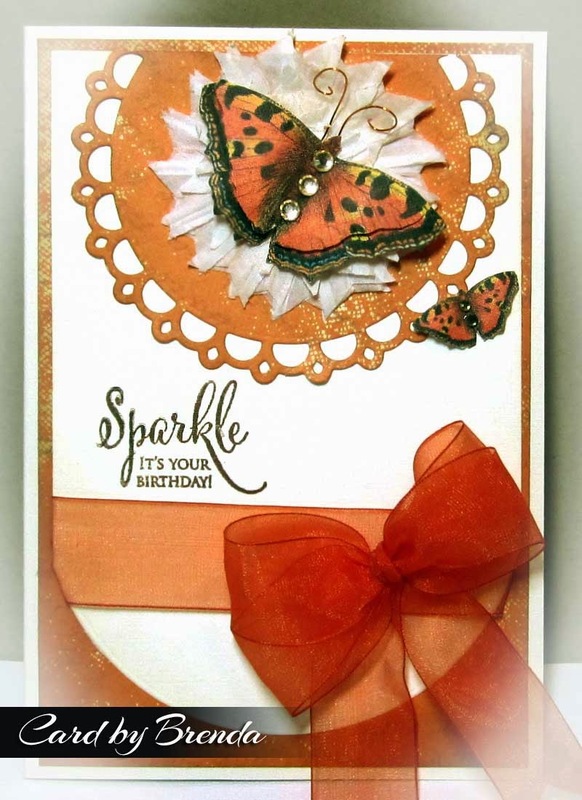 It also seems a good time to share another card which was over at Tattered Lace earlier this week using the beautiful Wondrous Butterfly, it's not unlike the purple and green card on the post below so I won't bore you again with all the details as I went into some depth on the link given in that post. Morning Peeps, we have a new Tattered Lace Eleganza Collection four day deal launching on Create and Craft today so I thought I would share a few more of my makes for the shows. Also my Penny Black DT piece which I should have posted yesterday but Blogger was having none of it, it took me hours to persuade him to allow me to do the post for the challenge blog so my own had to take a back seat. My Penny Black card does actually have some Tattered Lace products so fits in with my post nicely. It's another of my fancy fold cards and you can find my tutorial here, I am secretly hoping that Stephanie will make this into one of the shaped card die sets..............now how easy that would make life. The background for the Poppies has been coloured with Brusho's and the DP's are G45 which I used to paper piece Penny Black 4373K Red Tango.....I know I always seem to do it in blue, not that it's planned that way. The border sown the side is TL Chantilly Swag and sentiments are from the Butterfly interchangeable embossing folder. The card above using the Piaon and Dance dies was on the Tattered Lace blog yesterday so I won't go into all the details again as you can find them here. There had to be some inkiness and after creating the background with acrylic pains I then make the dragonfies using the Eleganza Bow die, when I saw it I instantly saw dragonflies so it had to be done! When did I ever conform to the expected ? The sentiments was made from the letters that are part of the Shutter card set........and before anyone asks, there is a proper 'Y' in the set, mine just happened to disappear under the floorboards when I dropped the whole set, in fact I was lucky to only lose one. So I made a 'Y' by joining a couple of other letters, call it artistic licence. And one final one is posted on the TL blog for today so you will find all details here. I have lots more to share using the Violin, Cherub, pillow boxes and much more, but will save those for another day. Thanks for taking a peek and hope you get to see some of the shows and if you are after buying any of the dies that they last a bit longer than in recent shows. Morning Peeps, it's a very wet and dreary start to the day here in the Fens and the forecast looks like more of the same, so one to stay indoors and keep warm I think. I thought I would share a few more of my recent Tattered Lace samples which were on last Fridays shows on C&C, as many of you know the shutter cards were a sell out in less than an hour leaving limited products for the weekend. But I am told they will be back again very soon, I have to say these are a real favourite with me as you can make them in minutes, I have spent many hours over the years trying to make this shape a score board and a good number have ended up in the bin. The pink Parisian inspired one was on the TL blog the other day so I won't bore you with the details as they are all here along with the product list. On this one I used the layering templates which are all part of the Shutter card set and added liberal helpings of glitter. There is also a full alphabet in the set. And here are a couple of sneak peeks of what will be coming up in next Monday programme ******amended, show has been brought forward to this Thursday 19th March****** for the four day deal, any ideas what they might be (not that there are any prizes mind you) ? The one to the left was a little experiment using one of the dies to make something completely different, I know again, but that's the beauty of TL dies, there is so much more to them than what you see on first appearances. I even managed to get a bit inky with some acrylics and stencils as well. It's Saturday morning and time for a new challenge at Allsorts and this week Mervi would like to see 'Flowers and Pearls. Our lovely sponsors are Hobby House. I guess some of you saw the programmes yesterday when the pick of the week sold out in the first hour of the show. Not sure what Nancy is going to do for the rest of the week, but I am not surprised they sold out so quickly as the shutter card dies are amazing, I had such fun working with them and know they will make more appearances from the team in upcoming shows. I am always happy to work with flowers and for my DT card I used a recently acquired stamp from Stampendous called Classic Roses. I stamped the image and heat embossed with detail clear powder and coloured in with my Chameleon pens and sponged some distress ink though a stencil. The DP's are both I think from BoBunny, a few years old and not certain though. I machined a scallop patter round the edge of the green base layer, matted the image and piece of contrasting yellow and finished with some roses, seam binding and trailing ivy leaves.......again not sure the make of the die.......I really should keep the packing or at least make a note. When is a baby shoe not a baby shoe, when it's a Butterfly of course !! Morning Peeps, a mega quick post from hubby's work computer, seems my computer issues are ongoing, had no access to mails, blogger or internet since midday Friday and fast losing the will to live as it seems to be a never ending sage. Seems the only way is going to be to totally dump my computer, lappy and tablet as they were all linked so shared the hacking problem. Meantime here are a few of my recent Tattered Lace cards which you may have seen here including the butterfly (made from the new Baby Shoe die) which Nancy apparently rather liked, thank you for your kind words Nancy. I have been busily working away on new creations for the Tattered Pace Pick of the Day which launches on Create and Craft on Friday 13th March. A heads up you will definitely want to made a note in your diaries not to miss this one as there are some awesome must have's in the show, ake it from me ! Hope you all have a good week and I will see you when I can get sorted. I'ts Saturday morning so time for our new challenge at Allsorts and today it's my turn to host the theme so of course as it's now March I had to choose something Spring related so it's rather predictably 'Spring is in the Air'. Our sponsors this week are Kraftyhands and Deedeeds Digis. I was a lucky girl recently and won the challenge at Chocolate Baroque and one of the stamp sets I chose as my prize was the Summer Fairy set, but with a bit of artistic licence it's becoming Spring. I think the flowers are Alstroemeria or even Freesias, but again with artistic licence I think I can get away with them being crocuses. I stamped the fairy in black archival, used Pan Pastels to create the background, stamped the flowers and coloured with Wink of Stella which I also used for the fairies wings plus a bit of glitter so there is some nice sparkles going on. I also sponges some sun rays glimmering down the scene. Hello Peeps, a little late posting this one, got my computer near enough back to rights but Blogger was not very welcoming when I wanted to post this, perhaps he's missed me ! It's time for our March challenge at FlonzCraft Vintage Stamping Challenges and this month our theme is 'Olde Worlde'. As always there if a fabulous $20 on line store voucher to be won from FlonzCraft. Don't ask me why, but I just couldn't get my head round this one, the words 'olde worlde' say all things Dickensian to me and I have nothing in my Flonz stash which I felt fitted that era, so I have gone with these 20's Fashion Ladies which I guess are from almost a 100 years ago so pretty 'olde'. I stamped the image in sepia archival and shaded very lightly with some pink DI and placed behind a die cut aperture. The DP has a very subtle pattern so I spruced it up with a bit of sponging through a Timmy stencil. Some crumpled seam binding, lace, pearls, Vintage corners and a cameo. My next two cards are from my next delivery to the Animal Health Trust using Nicecrane images from the Black Puppy and Butterfly twinches sets, all my cards seem to sell well at the AHT to help raise funds for their invaluable research, in fact usually almost quicker than I can make them and those with animals are especially popular. The sentiments on both are from one of the new Penny Black sets called Sparkles and Smiles. Time for our monthly challenges at Stamping Sensations and Penny Black and More where our themes are One for the Guys and Blossoms and Bows. My card at the top is my Penny Black piece using a few of my older PB stamps, all wood mounted which I far prefer.......call me old fashioned. I started by created a sky with a circle mask and Pan Pastels, I then stamped the PB Cherry Blossom and Daffodils quote using black archival, then the daffodils which I inked with distress markers adn spritzed with water before stamping several times. The little blossoms were made using a small craft punch, inked and a little pearl added to the centers and finally an organize bow. My Stamping Sensations card is a really quick and easy one, a background created with an acrylic block and distress inks and Penny Black 40-111 Breezy stamped with black archival and then again with a second stamping to give a faded look. Some twine, matting and layering and a ten minute make ideal for the times when you need a quick card for the guys. 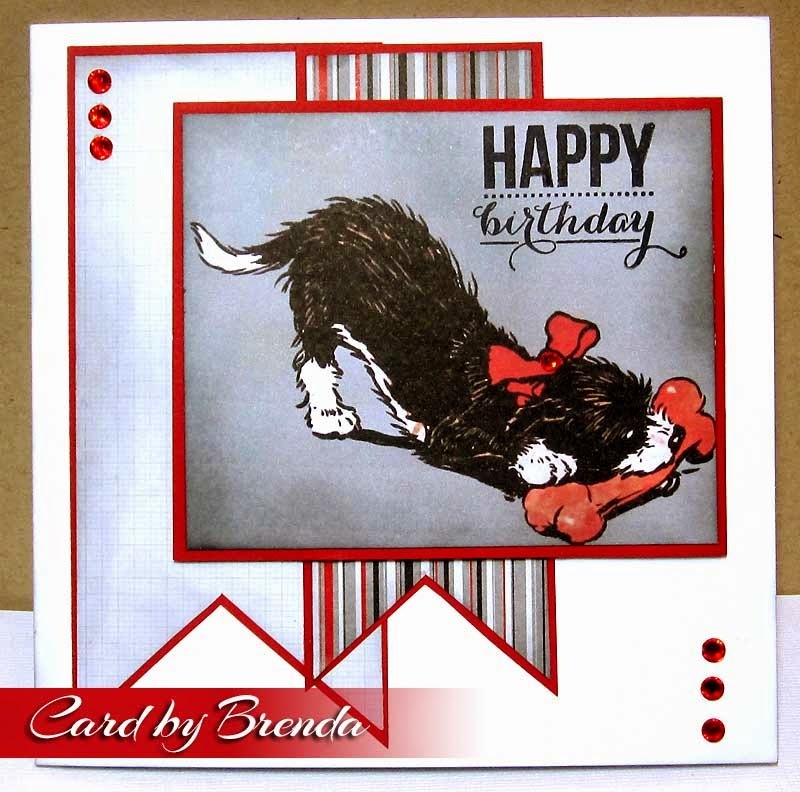 And just the one more using some of the new releases from Penny Black's Bring on the Happy Spring range. The background was created with Brushos, glimmer mist gold and cling film although it really doesn't show up too well in my photo. The daffodils are PB 40-378 inked with distress markers and spritzed with water before stamping and the sentiment is PB 30-297 Sprinkles and Smiles. With all the internet and computer problems I never managed to do my Penny Black mid month post so thought I had better add my card here. The background is Dylusions and Glimmer Mist along with Penny Black stamps 4040K and 30-229 and 51-008 Bashful die. I hope we will see you at our challenges this month, as always we have some great prizes to be won.